Thanks to Janine over at True Aim for sharing these great books with us! Make sure you stay to the end of the post because you will have the chance to win $25 of books for your own home library! Look up at the night’s sky. Do you feel small? It is hard to fathom just how big the universe really is. Maybe that’s why children are fascinated by it? 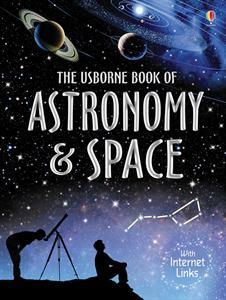 That’s why I’d like to share 10 amazing books about space for your kids. They’ll be so excited to tell you all of the facts they’ve learned. Plus, their love for reading will be reinvigorated or inspired by them! Before you take a look at these fabulous books, check out just how small we really are in this video of a super-high resolution image of Andromeda from the Hubble space station. Make sure you watch the end! One of my favorite things about space is how unique everything is. Each planet, every star, every asteroid has it’s own unique shape, size, and attributes that make it different from every other one that we can see. What’s your favorite? 1. 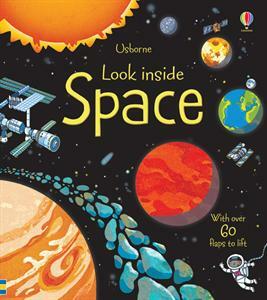 Look Inside Space – This Lift-and-Look book captivates young minds with over 60 flaps to explore! 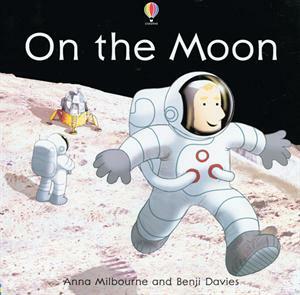 Children as young as 3 will enjoy finding out how the moon was made, why stars shine and how we know so much about planets that are far, far away. 2. 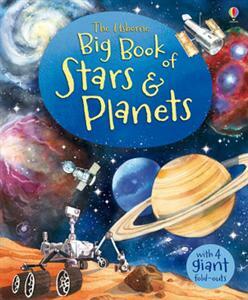 Big Book of Stars and Planets – Open the 4 giant fold-out pages to discover the wonders of space – The beautiful pictures in this book spur on great conversations. This book is also internet referenced so you can explore even more after you’re done reading! 3. On the Moon – Voyage closer to earth to see what it’s like on the moon! This is a book children will want to read again and again. 4. 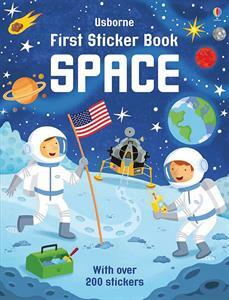 My First Space Sticker Book – Did you know? Sticker books promote creative thinking and reasoning skills? This book combines that with learning space vocabulary for a great hands-on literacy activity! 5. 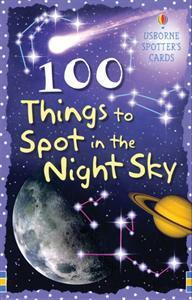 100 Things to Spot in the Night’s Sky – These are actually cards that show constellations and more that you can find in the sky at night. Do you have a star gazer? They’ll love these cards! It’s like a treasure hunt in the sky. 6. 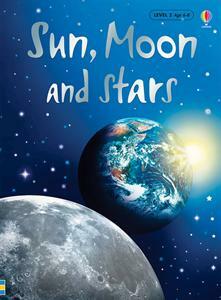 Sun, Moon, and Stars – Get more details about the most important things to earth in our universe. This book is also internet reference for more information after you’re done reading. 7. 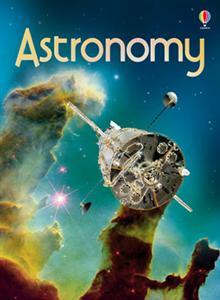 Astronomy – This beginners guide talks about how people study space. You’ll find information about rovers, telescopes and more in this internet referenced beginner. 8. 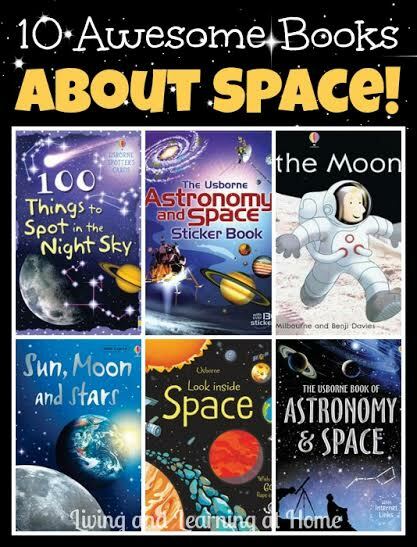 Astronomy and Space Sticker Book – With over 130 stickers, children will learn the intricacies of space through a seek and find sticker activity! 9. 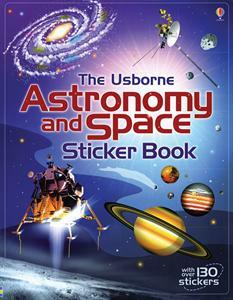 The Usborne Book of Astronomy and Space – With over 96 pages, you’ll learn everything you really need to know about astronomy and space. Internet links are included for more information on all subjects! 10. 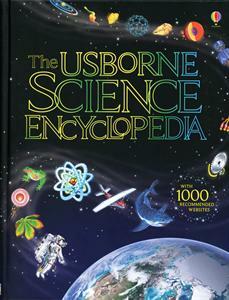 The Usborne Science Encyclopedia – To understand more about space, this book contains tons of information and definitions of essential scientific knowledge from a secular view point. This combined volume includes: Energy, Forces & Motion, Earth and Space, Human Body, Materials, Mixtures & Compounds, World of Plants, Animal World, and Light, Sound & Electricity.